Yong Green Food Melbourne // Nourishing & Delicious Vegetarian Cuisine. One of our all time favourite restaurants in Melbourne is Yong Green Food, who specialise in organic, wholesome, vegetarian cuisine. Most of their food is vegan or vegan-adaptable, and they also offer an excellent range of raw and gluten-free items. We enjoyed a delicious family dinner here recently, and it reminded us that we should share this beautiful restaurant with you all. Macro Dragon Bowl: biodynamic brown rice, topped with seasonal veggies, organic tempeh & seaweed. Served w lemon tahini cream + miso soup. We love Yong Green's vision and philosophy. They are passionate about sustainability, so use predominantly organic and plant-based ingredients. They also purchase accredited GreenPower to replace energy they draw from the grid, purchase carbon credits, and donate 10% of their profits to support farmer-managed natural regeneration in Kenya (a project partnership between AusAID and World Vision). We have built this business with the intention of creating a better world where every living being is respected. Matcha Buckwheat Crepes, filled with crispy tempeh, veggies & soy mayo. 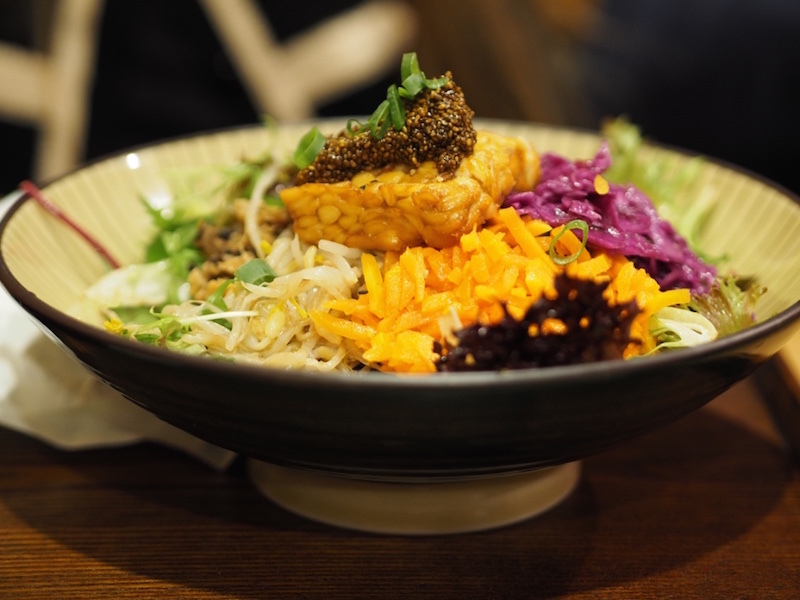 Kimchi Dragon Bowl: Biodynamic brown rice, topped with kimchi, coleslaw, micro-salad, cucumber, organic tofu, sesame oil and nori. Served with cashew cream + chickpea miso soup. Kimchi Gyoza with chilli soy sauce. Mango Lassi with almond milk. Teriyaki Wheat Chicken, served with biodynamic brown rice, steamed vegetables and house-made pickles. One of the best things about Yong Green Food is that you always leave feeling deeply nourished and satisfied. It's healthy, but you won't just be eating lettuce leaves. Think hearty curries on biodynamic brown rice, kimchi gyoza and tempeh burgers. If you're after raw cuisine, you can try a macadamia nut based live pizza, chia nachos with cashew cream, or a variety of raw desserts. Some of our personal favourites on the menu are their Dragon Bowls (brown rice topped with veggies, seaweed, tempeh/tofu and cashew cream/lemon tahini cream + miso soup) and the Buckwheat Crepes (filled with veggies, crispy tempeh and soy mayo). We should mention too that their service is always fantastic.. the staff are friendly and meals always come out quickly. If you're in Melbourne, and love wholesome, hearty, plant-based food, you definitely need to get yourself to Yong Green Food.